The story of this house can be traced back to 1812, when the building was part of the Pembroke Estate. The cottages in that area belonged to beaver hat maker families, who shared their houses amongst themselves and allowed the neighbouring families to use their facilities to wash their clothes. The small cottages were demolished, giving place to a development of mid-terrace townhouses. The homeowners bought this property 12 years ago, after looking for a family home in this sought after area of Dublin for 6 months. The house had a spacious living room and an added extension built with recycled bricks brought from the home of the previous residents. The family transformed the living room into an expansive kitchen with dining area and created a cosy lounge in the extended space. To suit their lifestyle, they installed a kitchen island to increase storage space. 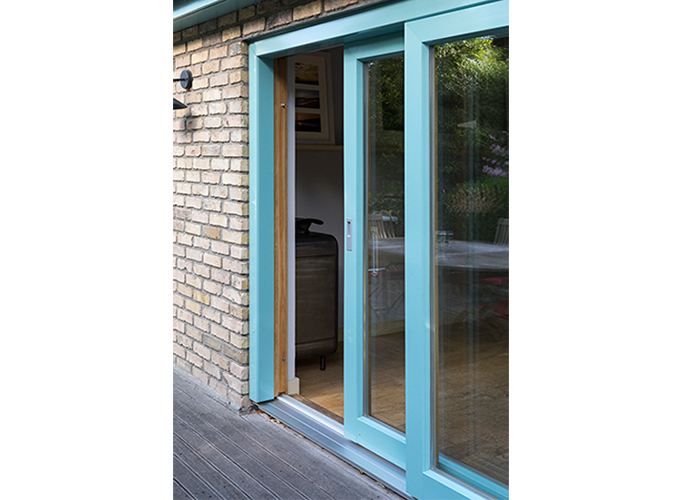 The rich turquoise pastel colour allows the patio doors to become a key feature of the rear facade. 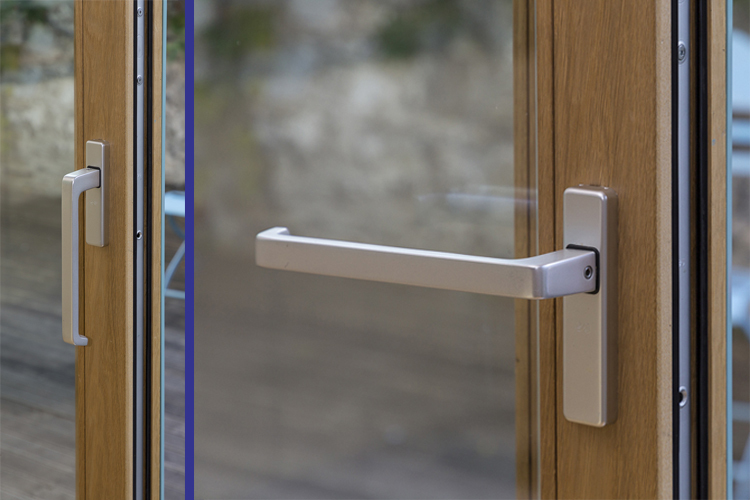 After researching some window and door companies, Signature was chosen to supply and install a turnkey replacement solution due to their quick responsive service and ‘Designed Around You’ philosophy. Signature Windows in-house team provided the homeowners with expert design consultation, technical drawings, a modern showroom with samples and hardware options, and a careful on-site survey to perform full installation of the units. 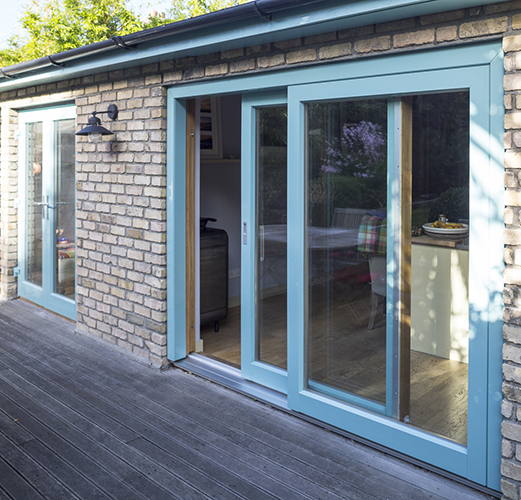 The original patio doors were out swing wooden French doors with side panels, which looked cluttered with too much timber in the way to the garden. All the doors at the back of the house, including French doors in the main room and a single door to the utility room, were rotten and under performing. Another issue was the weak seals of the doors, which made them very unsafe. 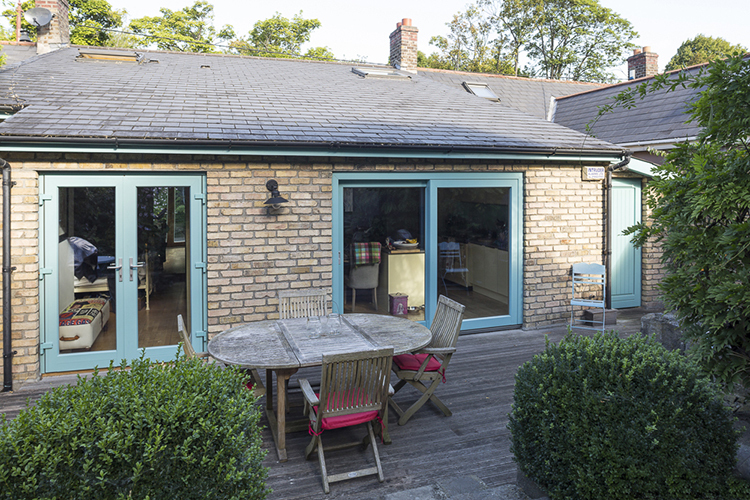 The wooden French doors in the kitchen were replaced with the Contemporary Signature Megrame aluminium clad wood lift & slide door to expand the access to the rear garden. 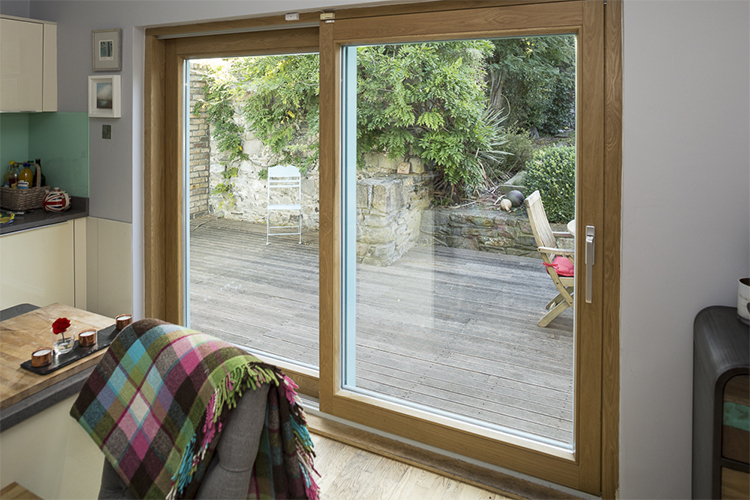 The two-panel glass unit created a natural flow from the hall door to the back of the house, increasing the amount of light into the room. The German engineered track and the multi-lock systems improved security and energy efficiency. 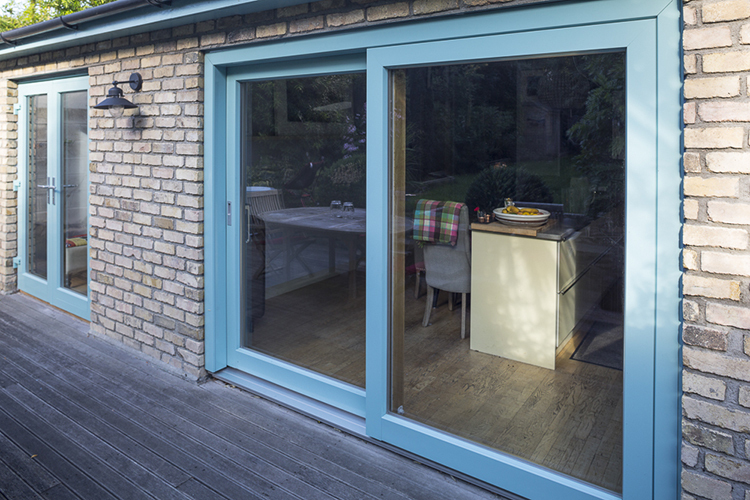 The sliding door plays a great role in the house, functioning as a passage way, a ventilation opening and an architectural feature. 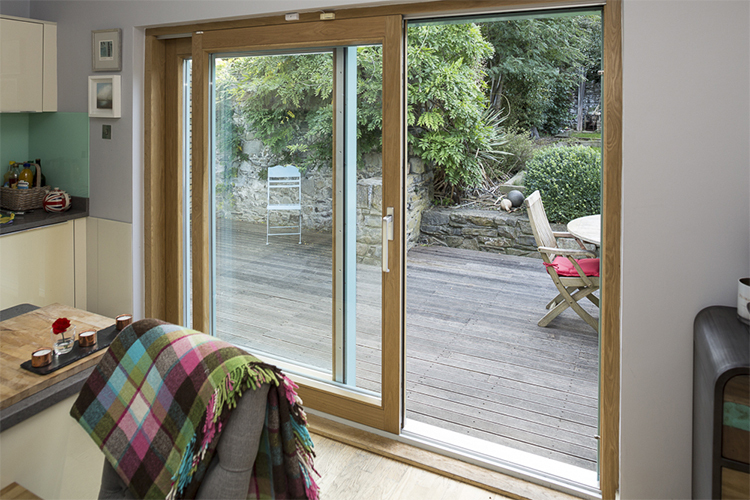 When fully closed, the high-performance lift & slide door noticeably improves the overall thermal and acoustic comfort inside the house. 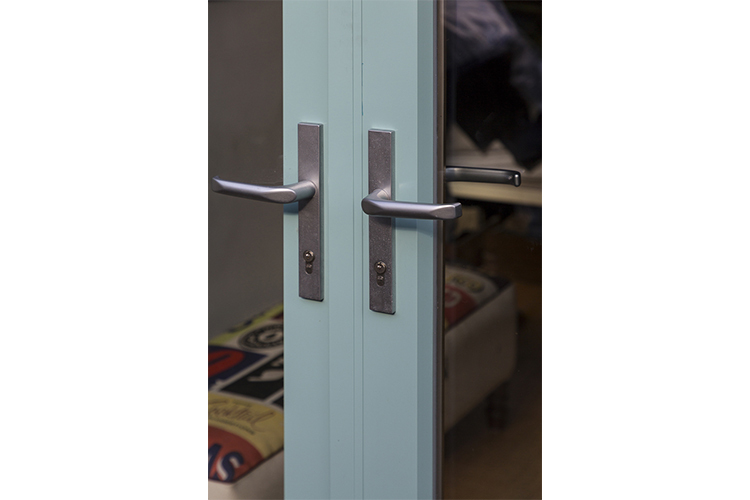 The opening direction was also advised by our experts since the old French doors didn’t take full advantage of the space. The sliding panel on the right side works very well in clearing the way to the corridor. 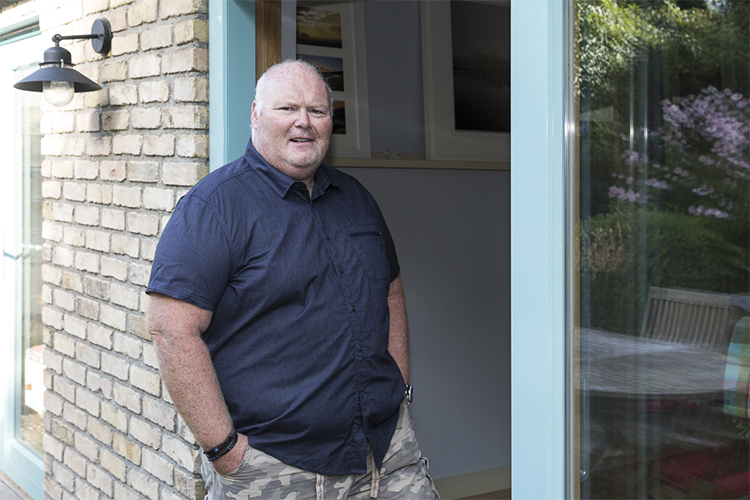 The wooden French doors in the bedroom were replaced with Contemporary Signature Megrame aluminium clad wood outswing French doors to maximise the interior space. 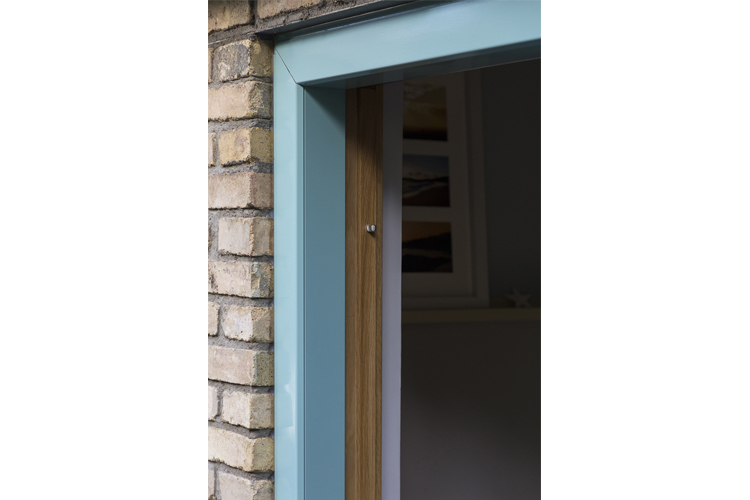 The low-maintenance exterior cladding provides optimal external protection for the internal wood in a long-term. 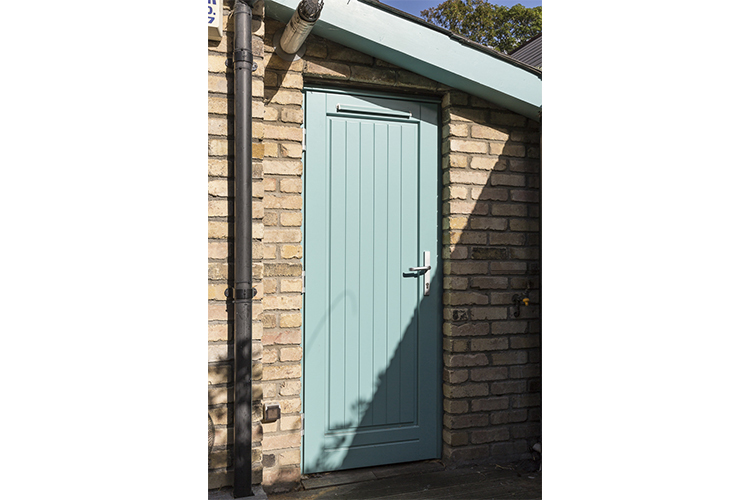 The single wooden door in the storage room was replaced with a Traditional Signature Megrame external door with factory finished paint to match the colour of the other doors. 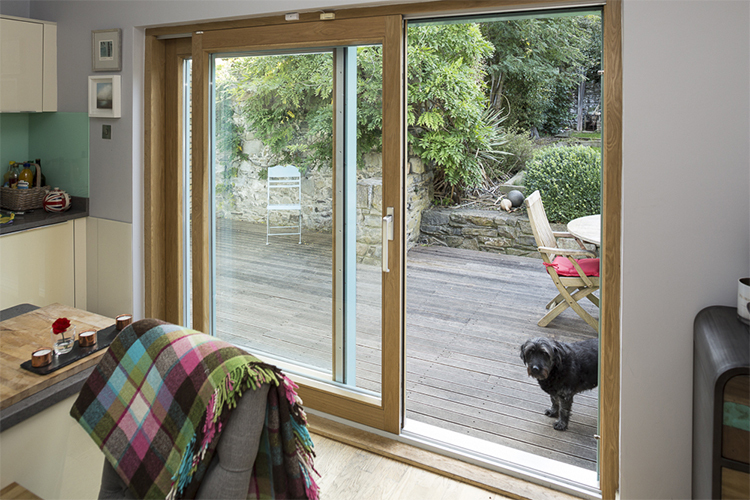 The aluminium clad wood patio doors have an oak interior to match the flooring and to add warmth to the rooms. 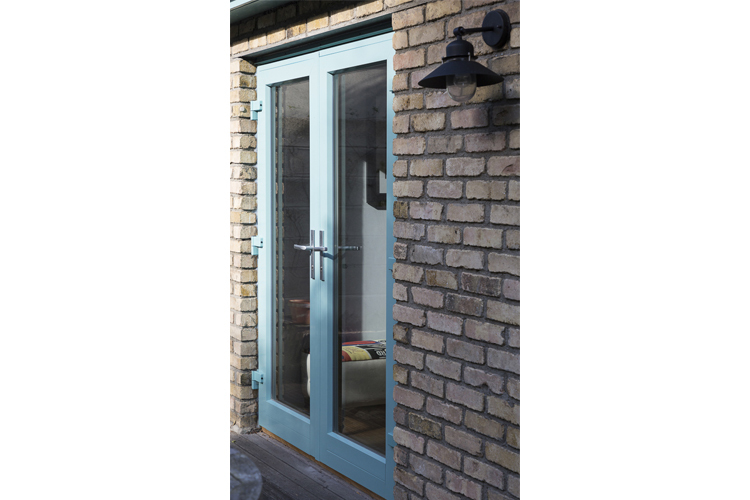 The external pastel turquoise colour adds character to the house since the homeowners wanted something different from the previous cream doors they had been living with for years. The Signature Windows engineering team faced a challenge to bring the 2700 mm x 2100 mm lift & slide door through the front door. In order to complete the job with minor disruptions, the installation team delivered the lift & slide door in sections and then assembled it on site. 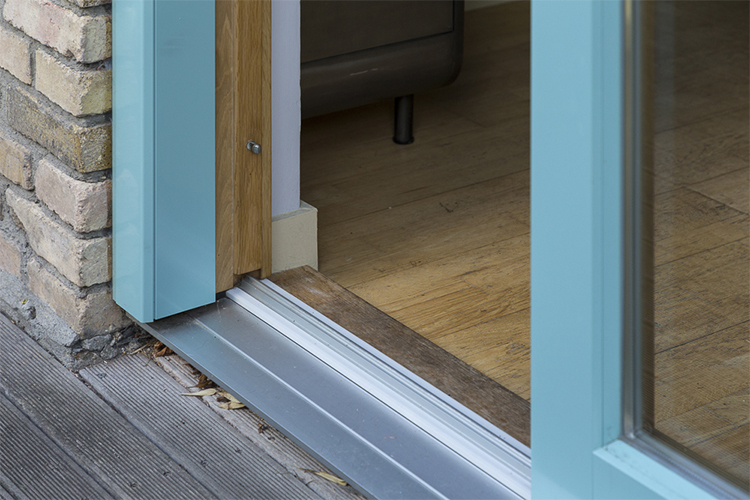 A threshold was built to match the level of the floor that had underfloor heating. 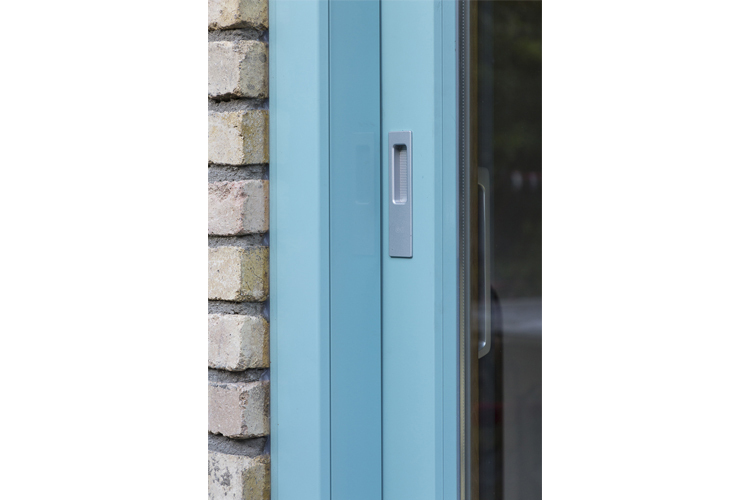 Signature Windows & Doors provided a comprehensive value engineering service with a solution that allowed the clients to combine different styles of doors with matching RAL colours and hardware options from our high-performance product range. To find out more information about Signature’s breathtaking aluminium clad wood lift & slide doors click on the link below.